(SNO) — At least nine people, including nationals of Saint Lucia and Martinique, have been arrested in connection with the dismantling of a large firearms and drug trafficking ring — arguably the biggest weapons seizure in Martinique, according to media reports. According to Martinique 1ere, 11,000 euros in cash, 130 kilos of cocaine and seized vehicles, the investigators have seized an “impressive” amount of firearms: military-style assault rifles, more than 17 automatic pistols, revolvers, 35 kilos of ammunition — weapons presumably for resale. 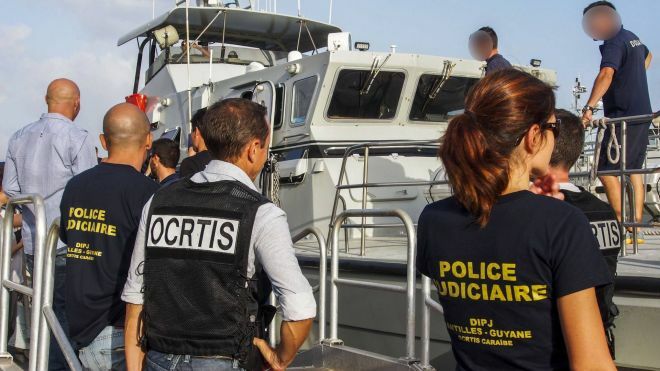 “This operation allowed for a seizure that is quite exceptional in the judicial history of Martinique,” said Jean Damien Moustier, head of the Caribbean branch of OCRTIS. The reports state that OCRTIS conducted the investigation with “colleagues in Saint Lucia and Venezuela for 10 months to identify the mechanisms of a team of traffickers who were responsible for importing and managing the weapons”. “The weapons that were stored serve as currency for narcotics (including cannabis resin),” Moustier said. Franck Robine, a government official, affirmed in a television news broadcast on Monday, Feb. 11, that “drug trafficking from South America also brings weapons in Martinique”. He said drug trafficking is one of the main causes of weapons proliferation in Martinique. “I was this morning with the navy during an operation carried out this weekend … nine drug traffickers have been handed over to justice,” Robine said.